Every time we walk into to one of our favorite hole in the wall joints, Ariana Kabob, we look at this little restaurant next door named Chicken on Wheels and wonder what it’s all about. Alas, we never seem to make it in because Ariana Kabob is so delicious. On this occasion we attempted to go to Ariana Kabob on a Sunday and when we got there we remembered the owner telling us they’re closed on Sundays. We got the idea that today was the day we’d give Chicken on Wheels a try. Chicken on Wheels’ Menu can be found on their Facebook page. Chicken on Wheels is a Peruvian restaurant, specializing in rotisserie chicken and grilled meats. We had sweet plantains, ceviche mixto, lomo saltado, and chicken with rice and beans. The sweet plantains were pretty straightforward, pan fried and caramelized on the outside, soft, sweet, and starchy on the inside. 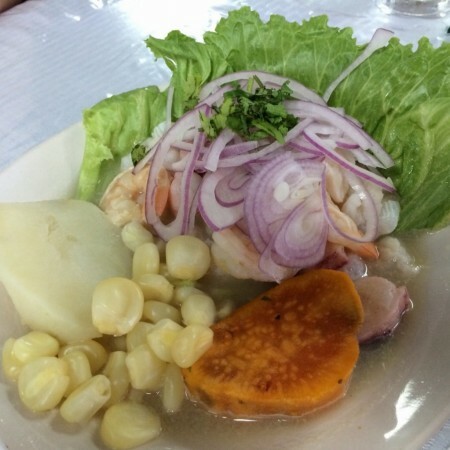 The ceviche we could take or leave. It had decent flavor, but really wasn’t anything special. We weren’t in the mood for spicy food this day so we opted for the non-spicy version. The waitress tried to convince us more than once that we should have it spicy so I’m inclined to think spicy might have been better, or at least hidden the bland taste of this ceviche. 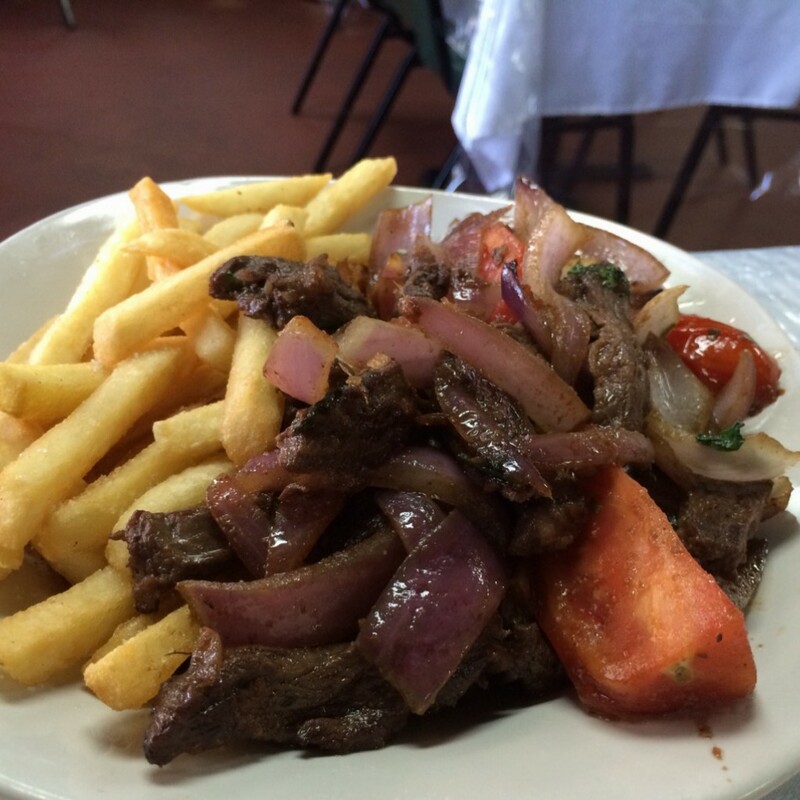 The lomo saltado ($12.99) (skirt steak with vegetables) was fairly good. The meat was tender and along with the vegetables had decent flavor. This dish came with French fries, which were neither amazing nor incredible. The longer we ate, the more the fries absorbed the juice from the lomo saltado which gave them added flavor and made them increasingly enjoyable. 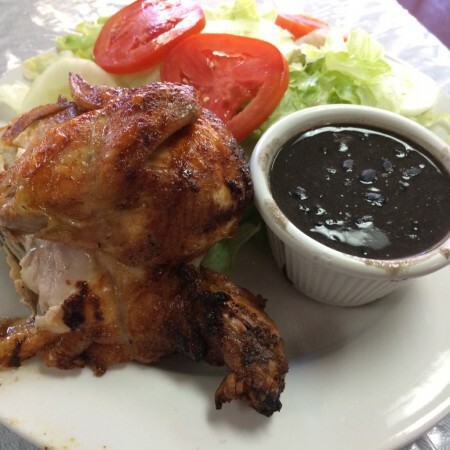 The 1/4th rotisserie chicken with rice and beans ($6.99) stole the show. The chicken was nice and moist and had a lot of flavor. Sometime you eat chicken and it’s just a “blah” protein. This chicken was delightful. Leaps and bounds ahead of grocery store rotisserie chicken. In fact, I can’t think of a better rotisserie chicken I’ve ever had. It’s really that good. The black beans were worth noting as well. They were not spicy, but had rich flavor. Sometimes beans are an afterthought and these were not. A+ on the chicken and the beans. Aside from the chicken being delicious, one thing we’re delighted to note is Chicken on Wheels offers family meals that are very affordable. Additionally, if you order take out for one of the family meals, it’s even cheaper. All of the family meals center around a whole rotisserie chicken and have more or less sides. I have brought dinner to two friends since we had lunch at Chicken on Wheels, and I let Chicken on Wheels do the cooking for both. The shining star is the Family Special Combo #7: 1 whole rotisserie chicken, rice, beans, French fries, salad, and a 2 liter (coke/sprite) for $19.99 (this same meal is $21.99 if you dine in). If you are of a certain age and have friends with young children, at some point life happens and your friend could use a meal delivered to their home. I’m resigning from cooking for these situations and instead picking up a family meal from Chicken on Wheels. It’s better for everyone. Easy for me, easy on the wallet, good for local business, delicious for my friend. What could be better? A couple of things to note: Chicken on Wheels doesn’t seem to believe in air conditioning. It’s hot as blazes in the place. It was hot enough that we almost didn’t stay for dinner. Maybe it’s on wheels because you’ll need to grab the food to go if you don’t want to be bathed in sweat by the time you leave? Secondly the menu is huge. Tiny restaurants with huge menus always scare us a bit. Are they serving us food that’s been there quite some time or frozen items? Can you really stock enough fresh product to cover that cavernous menu? Maybe we’re just skeptics. Lastly, if you’re headed to Chicken on Wheels for chicken you’ll want to call ahead to make sure it’s ready when you arrive. We ended up with a 15 minute wait. The waitress did a good job communicating that there would be a wait when we ordered and it was no big deal. For rotisserie chicken to go you’ll be hard pressed to find anywhere that’s a better choice than Chicken on Wheels. For dine in service and amazing traditional Peruvian cuisine we imagine you could find better options. Tagged Alcohol Serving, chicken, kid friendly, Latin American, Peruvian, Takeout Available. Bookmark the permalink.